The Poets' Garden (former Finance Garden), with an area of around 2 hectares, is located on the site of a bastion built in 1638 during the Thirty Years' War. With the founding of the Theatiner Monastery, the grounds were given to the monks for use as a kitchen garden and a garden house was built on it. In 1759 the electoral observatory, which is no longer in existence, was installed in the ruins of this garden house. 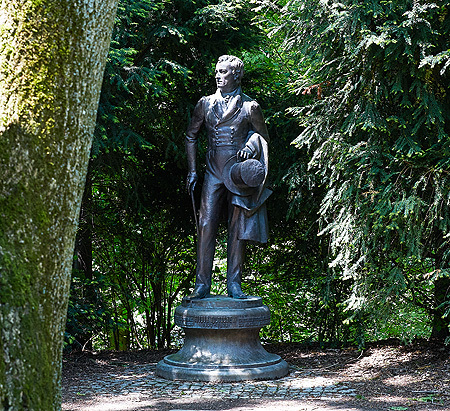 Today the Heinrich Heine Fountain is located in the grotto below it. In 1799 the electoral minister von Salabert received permission to build a palace at the foot of the bastion, thus frustrating Friedrich Ludwig von Sckell's plans for a continuous green area from the court garden via the Poets' Garden to the English Garden. After the death of Salabert in 1807, Sckell submitted plans to King Max I (1806-1825) for the transformation of the monastery garden into a landscape garden. The land register from the beginning of the 19th century shows this version, so that it can be assumed that it was actually created. Later the garden was considerably reduced in size by the roads that were built around it. From 1825 the garden and the palace were used by Prince Carl, who gave the building its present name. From 1918 the palace was used for a time as the residence of the Bavarian Finance Minister, who also had the right to use the garden, and it thus became popularly known as the "Finance Garden". After the 2nd World War, a petrol station and later a car park occupied the western part of the Poets' Garden. It was not until 1984 that this part of the garden once again became a public park. Apart from the Heinrich-Heine monument and a bronze statue of the Russian poet and diplomat Fjodor Tjuttschew a Konfuzius statue was also built in the year 2007. Other poets and writers who are connected with Munich should be perpetuated here.